Jennifer Lawrence was on fire during the second movie of the Hunger Games: Catching Fire. 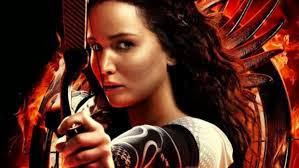 A brilliant emotional portrayal of the reluctant leader that stole our hearts as Katniss Everdeen. We discover a more grown up version of the Mocking Jay with part two and after the post traumatic stress she's dealing with after the Game, it show beautifully on screen. This reviewer wanted to join Haymitch in a drink watching the heart-wrenching scenario unfold. President Snow (Donald Sutherland) was easy to hate and made the perfect villain, which played right into giving Lawrence the spotlight she so rightly deserved. As a long time Woody Harrelson fan, this role is such a delight to watch and friends who remember him from Cheers will get the humor that he's now the drunken tutor that we finally understand is dealing with his own Post Traumatic Stress from playing in the Hunger Games. Five out of Five Stars from Tears of Crimson (and the reviewers giving lower ratings were either on crack or didn't see the same movie). We're are waiting impatiently for the third in the series and even going in knowing we'd be left hanging for the conclusion, it still made us cling to our seats hoping the show would keep going on. The writers did a fantastic job as did the supporting cast.